IN creating Nigeria’s first indigenous big Broadway-style musical drama, Saro, the Musical, Bolanle Austen-Peters (BAP) Production has started a process that may well open doors wider for Nigerian youths to express themselves vigorously in cultural productions. Given that joining the bandwagon is essentially Nigeria’s way of life in doing business, it is the fervent wish of all well-meaning people in the culture industry for Saro, the Musical to succeed greatly. It’s also for this reason that all well-meaning Nigerians – both private and government, especially private corporations – are enjoined to put their money where their mouth should be in helping to re-engineer a conspicuously neglected but important economic aspect of the polity, in this instance, the cultural. Nigeria’s cultural production life has shown itself to be the most resilient, self-sustaining, inventive and even innovative. While a certain amount of training or education is required, it starts with raw talent, which can be groomed in some form of apprenticeship or on-the-job training, with little entry experience. This is so because it taps on the innate, God-given talent that is latent in the individual, which can be drawn upon any time and put to service. A little training or education brings it into full fruition. It’s the reason why many producers or practitioners in the creative, cultural industry are individuals that had their training in other areas of life, but who, after wandering in the desert as prodigal sons and daughters still find their ways back to the creative sector, where their hearts had really been. Therefore, like other great cultural productions, Saro, the Musical is heavily pro-youth; it’s the celebration of freedom through music and its interpretation through dramatic expressions. Saro, the Musical is the story of rags-to-riches. Feelings of confinement and frustration lead a group of four young performers to embark on a journey in search of their destiny. The boys shake off the shackles of complacency and head for a land that promises limitless opportunities. Inevitable human emotions ensue, including love, fear, jealousy and the inevitable ‘successes. Freedom is what these young boys seek and Lagos has the potential to offer these emerging artistes an escape from poverty. A devastating experience lands them in the lap of destiny, success ignites them and love fuels them. Will their purpose be fulfilled? Destiny is always inevitable. In the face of malignant unemployment, the Nigerian youths have found a way out through the creative industry comprising music, movies, literature or writing, visual arts, drama or theatre. Perhaps, the largest area of migration for youth’s creative energy has been music with the numerous reality TV shows on offer in the country. From MTN Project Fame, Glo X-Factor, Nigerian Idol, West African Idol, Maltina Dance All and several other ones in the works, youths have been finding their voices. And of course, credit must be given to Plantation Boys, the foursome, whose entry into the hip-hop music scene in the late 1990s heralded what is now a massive boom and revolution in Nigerian music, with its localised, indigenous language flavour, a veritable, peculiar linguistic export for the country. From the local airwaves in radio and TV, Nigeria music made by Nigerian youths is the anthem. It has shoved America’s music import out of the way. It’s indigenous; it’s our own and Nigerians are happily patronising and enjoying it. It gives a lie to Nigeria’s import-dependence and taste for foreign products, especially in government circle, that indeed, nothing produced in Nigeria by Nigerians can be patronised by Nigerians. Perhaps, it’s time for a major psychological re-adjustment in the direction in which Nigerian music has gone. Nigerians as a whole need to borrow a leaf from its ebullient young musicians, who have made something momentous out of relatively nothing, especially in the last decade. The music being made by Nigeria’s youth has redefined the country in positive light. We mustn’t forget that former Head of State, Gen. Yakubu Gowon was once described in Europe as having come from Fela’s country and not the other way round. This is a second revolution for Nigerian music. All the corporate bodies supporting Nigerian music must be commended for their faith; they deserve a tax break or rebate, as it is done in societies that value a keen expression of the humanistic spirit. They only need to be encouraged to extend their hands of fellowship to other creative, cultural fronts, like Saro, the Musical and such other cultural productions. This is not a self-serving call. It redounds well to their credit that they are helping to redefine Nigeria’s cultural landscape and actively helping to engage the mind of youths and taking them away from the streets and its attendant negative impact on the larger society. Such call means that there are other culture or creative areas that abound with youth energy; every youth cannot be a musician. 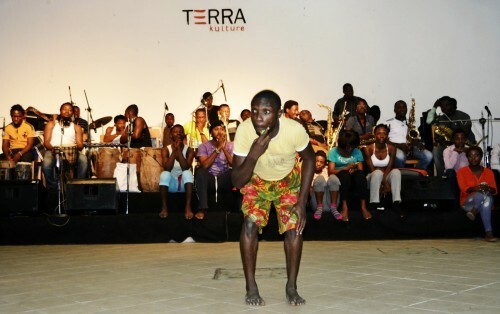 There are youths whose creative interest is in drama or theatre, which Terra Kulture’s Theatre@Terra has championed for several years now. It’s what has also culminated in Saro, the Musical, with its unique blend of musical engagement and theatrical performance combined to give wholesome experience. It’s a massive fusion of music and drama for the creation of spectacle, which further gives therapeutic value for society’s health. The movies also offer another opportunity for Nigeria’s corporate support. A unique example is Chimamanda Ngozi Adichie’s Half of a Yellow Sun, the Orange Prize-winning novel, which has just been shot into a film. It first went to town at the just-ended Toronto International Film Festival; it heads for the Caribbean in a few weeks. This is an instance of literature merging with movies or films to produce unsurpassed, creative experience in the exposition of Nigeria’s massively unexploited cultural riches. This example is a continuation of foremost novelist, the late Prof. Chinua Achebe’s iconic novel, Things Fall Apart in the 1980s, when it was shown on television. More of such marriage of literature and film can only add to the country’s rich cultural experience, an experience that can only be possible when Nigeria’s corporate industry lends its support. It’s not charity but big business doing business with a country’s creative, culture industry. Indeed, Nigeria’s cultural industry will be greatly served when Saro, the Musical, opens at Oriental Hotel, Victoria Island, Lagos, from October 25 through to 27 and beyond. It presents a spectacular moment for showcasing Nigeria’s artistic prowess to the world. When, some years ago some South Africans brought Umoja, essentially scantily dressed women dancing on stage, a production with dubious cultural value, Nigeria’s corporate industry supported it. In addition, when some Americans brought back our own Fela! on Broadway, Nigeria’s corporate industry fell over itself to support it. Saro, the Musical, is a direct response to the challenge Fela! on Broadway presented. This is a chance to sell the country’s big stage to the outside world, as the creator and producer, Austen-Peters is willing to take this uniquely Nigerian Broadway-style theatrical to the world. Government’s support for cultural production has long been written off, such that even government and President Goodluck Jonathan-inspired cultural project like Bring Back the Book (BBtB) has died a natural death; indeed, it suffered abortion or stillbirth. Therefore, the onus is on Nigeria’s corporate industry to deliver once again on youth creative energy. Saro, the Musical is yet another opportunity to do so. Now is the time to start, especially for those who have been sitting on the fence while the likes of Glo, MTN, Etisalat, Nigerian Breweries Plc, Fidelity Bank Plc have been blazing the trail in projecting the country culturally.